A cutting point is an empty point between two chains of stones. If the opponent plays at that point, the two chains are cut. Black has a cutting point at the circled point. If the cutting stone can be captured immediately, there is no cutting point. In this position, a white move at the marked point puts itself in atari. 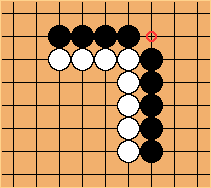 Black's stones are in fact connected by a hanging connection. White can of course threaten to cut. 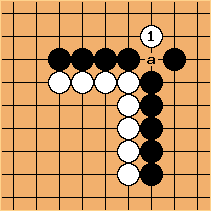 After White 1, there is again a cutting point at a, so Black now has to connect there. White 1 is called peep. It is important to defend your cutting points. There is a general question about how to defend. It is one of the simpler issues about good shape. In this diagram, the marked black stone protects the cutting point in a fancy way (see keima protecting the cutting point). If White cuts, her cutting stone will be captured in a ladder towards the bottom, or in a loose ladder towards the left. So in a broader sense, there is no cutting point, yet this position still contains some aji.